This version of Chicken BBQ Kabobs is fairly easy to make. Chicken chunks are marinated in a mayonnaise mixture, then grilled to juiciness and basted with a flavorful bbq sauce. These Grilled Chicken Skewers make the perfect juicy side! After trying a piece of shish kabob right off the grill, I ended up finishing the whole skewer (these were so juicy and good!) Chicken Kabobs can easily be made for a big crowd and if you make it to any left overs, no problem, BBQ Skewers make a great grilled sandwich (just be sure break down the chunks.) 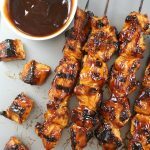 This is defiantly a version of grilled kabobs to try and the baste can surely sub for any dipping sauce as each piece of chicken is smothered in bbq sauce. 1. Whisk together the mayonnaise, ranch and spices in a medium sized bowl. 2. Add chicken pieces and toss to coat. Marinade for at least 2 hours. 3. Securely thread chicken kabob pieces onto the skewers and preheat the grill to high heat (about 450 degrees). 4. Place Kabobs onto the grill and cook for 3-4 minutes without turning. Then flip, baste with bbq sauce and repeat with other side. Baste both sides of the kabobs with bbq sauce again right off the grill. This version of Chicken BBQ Kabobs is fairly easy to make. Chicken chunks are marinated in a mayonnaise mixture, then grilled to juiciness and basted with a flavorful bbq sauce. Whisk together the mayonnaise, ranch and spices in a medium sized bowl. Add chicken pieces and toss to coat. Marinade for at least 2 hours. Securely thread chicken pieces onto the skewers and preheat the grill to high heat (about 450 degrees). Place Kabobs onto the grill and cook for 3-4 minutes without turning. Then flip, baste with bbq sauce and repeat with other side. Baste both sides of the kabobs with bbq sauce again right off the grill.